The following is a description of what to expect from Perma Pools. Let's assume you have decided to have Perma Pools build your inground pool and we sign a contract. What happens next? FIRST, RELAX. It is the builder’s responsibility to make sure the process moves along and that you are generally kept informed. Feel free to keep in touch by email or phone and we will do the same. But relax with the process…..many of our customers assume too much responsibility; it is not your responsibility to be the builder, that is what you are paying us for. DESIGN AND PERMITS FOR INGROUND POOLS IN INDIANA. After we sign a contract, we want to finalize the design and put together a drawing of what we are going to do so that we can apply for a permit immediately or at least soon. I stress “immediately” because something could come up in the permit process that has to be dealt with…..so the more time to deal with it the better !!!! When we apply for the permit, we don’t have to have every detail tied down but we do need to have the location of the pool fairly set in stone and the general shape of the deck all shown on a scaled drawing. Some towns require more. Better drawings may exist or may follow--but the permit drawing needs to get done right away. For this purpose, we will need a copy of the plot plan for your property. If you don't have one, we can assist you in obtaining one. The design can continue to be perfected right up until we start and there may be a lot of discussions during this period. COORDINATION. Between the contract signing and the start, we will be making sure that all the appropriate materials are on order and that all of our subs are ready to start. There may also be additional third parties that need to be on the same page such as a landscaper or builder. We are experienced in such coordiination and, depending on the situation, a site coordination meeting in advance of the start might be appropriate. THE START. We have picked a start date, we have a permit. We adjust the date for weather, people, your vacation, maybe your landscaper etc. Then, on the appointed day, we start big time! Excavators, dump trucks and all sorts of people show up at your house and they are ready to get going. Generally, there is a short 20 minute or so conference with you to go over the plan and to answer questions, then all of those people and equipment go to work per the agreed plan. Fiberglass. Generally, we will dig and set the fiberglass shell on the first day and put water in it and plumb it the second and third days. Vinyl Liner. Generally, we dig the pool, set the walls and pour the footer to stabilize the walls in about 2-4 days. We pour a vermiculite bottom—clearly the premier bottom but also the most weather sensitive bottom. It has to be reasonably dry to pour and not rain for a day or two after the pour. Frustrating delays may occur during periods of rainy weather. 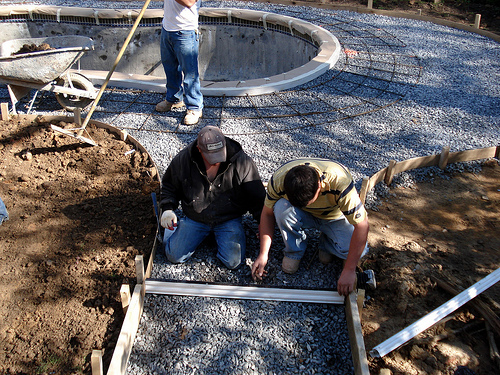 The pool equipment is generally set sometime after the footer because we pour the equipment pad at the same time as the footer. Then the pool is plumbed. This part of the work generally takes about 2 weeks or so depending on weather. PRE CONCRETE DECK WORK AND POURING THE DECK. There are a variety of things that need to be done prior to concrete being poured including plumbing for special features, possible retaining walls or drainage work, grading, inspections by the local authorities, coordination with landscaper, concrete prep, review and correction of work etc. This work usually takes about a week—but again, is subject to weather conditions and our work flow. Then we pour your deck. Regular concrete usually gets done in 1 day and stamped concrete and exposed aggregate usually take about 3-5 days due to required sealing and required sealer drying times. FINISHING UP YOUR INGROUND POOL. If you have a vinyl liner pool, the next step is dropping the liner in and filling the pool. If you have a fiberglass pool, we move right to the clean up phase. Clean up may include multiple cleanings of your pool especially if it is a fiberglass pool that has sat for a week or two getting dirty and especially if you did stamped or exposed aggregate concrete. After concrete, we also have to get your dirt back together and grade out any ruts that may exist due to vehicles. We leave your yard with having done what a good bobcat operator can do (known as a rough grade—not a finish grade). With minor prep, you should be able to move right into the grass planting phase depending on the quality of your dirt. We then deliver you your maintenance and safety equipment. There is then a final inspection of your pool. This work takes about a week subject to weather (especially for the rough grading work which requires very dry soil). POOLSCHOOLAND PUNCHLIST ITEMS. We then arrange a pool school for you so you can learn about water chemistry, how to clean your pool, how to feed and care for your equipment etc. We bring your warranty information and instruction manuals. The technician will also note any punch list items that need to be taken care of and will report them back to the appropriate person for scheduling. RELAX AND ENJOY---It is our sincere hope that we will complete your inground pool with the least number of hassles and as quickly as possible (although I think we would all agree that a quality pool is better than a fast pool). We are not perfect and we always strive to get better. Always let us know how we can improve; feedback is greatly appreciated. But most of all, relax and enjoy your pool and know that we are here when you need us. Thanks for your trust in us. Site References: Check out Perma Pools fiberglass pools or vinyl liner pools. And here is an article on the general costs.